I borrow some books from my city library twice a month. Lately, my favorite borrowing book has been just only the English book for the child at the library. In sheer reading, it's easy, fun and educational to do it, but the cost isn't low. I would say its cost performance isn't much better. So I go to the library regularly to free books. While the circulation is the valuable service, the return is a slight bother and I forget to return the book to the library often. On top of this I sometimes forget returning the book to the library. That makes me feel very upset. Still, I'm convinced it's worth to go so far. Here comes the funny movie! It's funny-haha. His thick Japanese accent is tricky! In some ways it's nicer than mine, because he can speak English very fast!! As I said, I thought his thick Japanese accent is was tricky when I heard it. I used the word 'tricky' in the sentence. Why did I? I'm not sure, but I saw a comical message in his English because it is a an exaggerated Japanese accent. So I believe his speech is a deceitful act. I couldn't decide to make myself take the e-TOC's lesson for writing. Let me think about it for a few days. I'm not sure it make my English skill improve very much. Add to, I don't know how I make me bring my ideal goal. The great thing about today had been that surfing around blogs is a hit of a good photo on the flickr.com. This photo is a workroom that have a woman who perhaps had succeeded in IT industry. It is my ideal workroom! I want to be a owner of a such room someday. So I thought about it. Because I got a great hint from "The secret" 3days ago. I think I was a good homemaker today. I found a large cauliflower and some fresh carrots at the store I frequents. I bought it for competitive prices. By that I mean they're very cheaper than other vegetables and help saving my money. 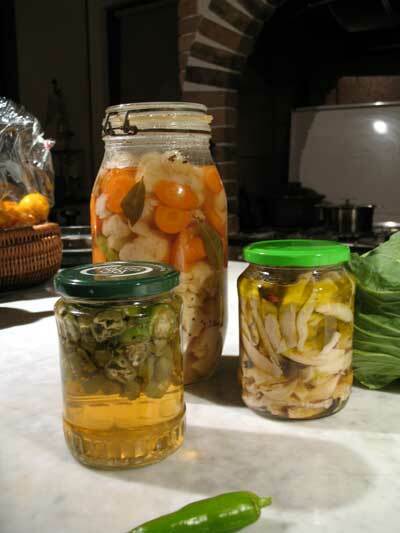 A cauliflower's pickles is one of my favorite preserves. And oiled mushrooms, too. Oh,it look yummy. How long I can wait? ---English---I have to drink water a lots. As you probably know, if you've read my past entries, I exercise at Curves nearly everyday. There was the day of a measurement to me last Friday. I had expected to have lost some weight this time. I believe it's important not only to do exercise, but also to eat macrobiotics. That's why I expected to have lost a lot of weight, but I only lost a little. I asked the staff what I should do if I'd like to lose my weight. She answered if I wanted to get it, I have to drink water 1500cc or so.
" If you continue it as a habit, you'll soon see an amazing effect!" she said. As you probably know, if you've read my past entries, I go to exercise to Curves nearly everyday. There was the day of a measurement to me last Friday. This time, I had expected losing my weight a little before I went. I believe it's important not only to do exercise, but also to eat macrobiotics. That's a reason I expected but I couldn't reduce my weight lots. I asked staff if I'd like to lose my weight what should I do? She answered if I wanted to get it, I have to drink water 1500cc or so.
" If you continue it as a habit, you'll see soon an amazing effect!" she said. English Essay---Friend of mine attempt. A real friend of mine decided to take a online lesson with Internet this week. One of the reason that he take it is the disintegration of NOVA for its bankruptcy. He lost a space to enjoy conversation in English and to keep his peace of mind. He seems to me that he has got a lot of problem on his life and also is not always a good condition of his mental health. He said me that NOVA's not only helping out him from the deep depression and stress, but also recovered his confidence whenever he went. Alternatively he tried online lesson for the first time the other day. I hope now he enjoy it every moment. The decision is final. Something tells me I'm going to pluck up a good heart for this design. It seems nice and appealed to the gut as if it'll bring me something good. My little gray cells always mixed up, so I don't want to create in chaos my blog. Simple is the best what I want to see. Where would I be if I tried to make a all sorts of colorful blog? It might kill more my free times that I have, and your time to watch. my favorite template had goooone! Although I don't know why, my blog's template had gone since yesterday. My blog seems a monotonous notebook, because there aren't any colors and pictures. So I spent to reconstruct with its new design all night. I was hectic until a few minutes ago. Somehow I like former design than this. I can't complain, though.